Coca Cola is running “Gardener”, a television commercial starring British model Andrew Cooper. Set to the Etta James track, ‘I Just Want To Make Love To You’, the advert shows a group of young women flirting with a lawn-mowing gardener. 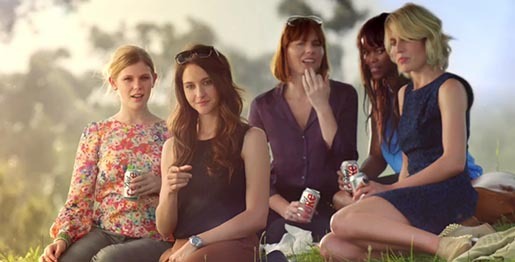 A can of diet coke is rolled down the hill to catch his attention, only to cover him in spray when he opens it. The ad was released this week to coincide with the brand’s 30th anniversary in the UK. The Gardener spot was developed at BETC London by executive creative director/art director Neil Dawson, copywriter Clive Pickering, designer Louise Sloper, producers Karen Egan and Lotte Whatmough, executive planning director Andrew Stirk, senior planner Caroline Collinson-Jones, account leads Romilly Martin, Zoë Hinckley, CEO Matthew Charlton. Filming was shot on location in South Africa by director Rocky Morton via MJZ with executive producer Debbie Turner, producer Chris McBride, director of photography Nicolaj Bruel and art director Riccardo Pugliese. Editor was Joe Guest at Final Cut with executive producer Michelle Corney, assistant editor Paul Moth. Visual effects were produced at Finish by Flame artists Judy Roberts, Jason Watts, David Clifton, producer Cheryl Payne, colourist Paul Harrison, CG artists Harin Hirani, Alaric Holberton. Sound was produced at Wave Studios by mixer/engineer Parv Thind and executive producer Amber Clayton.